One cannot help but be woken up to the sounds of vuvuzela horns blaring from early in the morning, as trucks and cars bustle about, and the bright orange sun and hazy air remind me that I am finally here in Nepal with the Women’s Health team. After months of planning, countless emails, forms, and planning meetings, we arrived on Sunday (19thMarch) in Kathmandu. We were greeted by our Nepalese counterparts who warmly welcomed us before we jumped on the bus to our first stop – Scheer Memorial Hospital in the (somewhat) nearby town of Banepa. A crowd of several hundred women and men were waiting for us. Our team of volunteers comprising of veterans and ‘newbies’ are all excited to work and serve alongside our Nepalese colleagues. The purpose of this visit is to provide surgical intervention to women suffering with the debilitating condition of uterine prolapse – a very common condition experienced by hundreds of thousand women here, while at the same time providing education and building the capacity of the medical team at Scheer Memorial Hospital. Our first task as we arrived at the hospital was to unload all the gear that has been transprted from Australia, and re-open the storage trunks left in Nepal. For many of the team, the rest of the day was devoted to sorting out the gift bags we prepared for each patient post-surgery. Some of the items in the gift pack included socks, toothpaste, toothbrush, moisturiser, beanies, shampoo, bras, undies and lip balm. Giri, one of OHI’s volunteers, was not able to come this year but still generously donated 80 woolly blankets for each woman post-surgery! We finished our set up at the hospital and set off to our hotel, the aptly named Himalayan Horizon (well so I am told) for the night. A cold-chilly morning awaited us on Monday as we set off for our 4km walk from the hotel to the hospital for the first day of patient assessment. 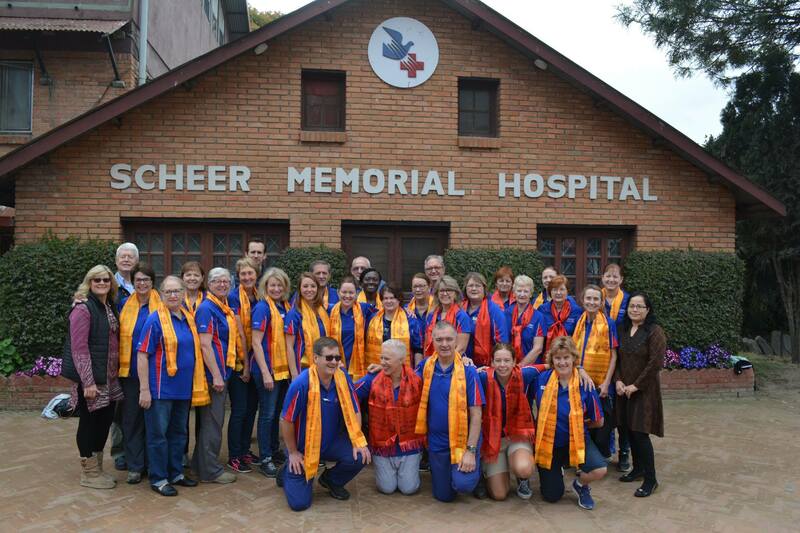 We were officially welcomed by the Scheer Medical Management team and each volunteer draped with a bright yellow scarf and “Namaste” greetings. Soon after that the team split into the various roles which comprised of obstetrics/gynaecology assessment, anaesthetic review, theatre for surgery, recovery post-op and ward. I spent most of my morning in the obstetrics/gynae assessments where Dr Lisa Robinson, Dr Geoff Paul and nursing staff Michelle Dixon and Sue Reid and were teaching and transferring skills and knowledge to eight local health staff on identifying prolapse and any other gynae issues requiring surgery. Rebecca Hilton our Administrative Support Officer was taking patient history and working alongside one of the local health staff who was translating. In total over 60 patients were assessed, and the first six had surgery to correct their uterine prolapse. After a long and full days’ work completed and we set off back to our hotel for dinner and early night rest.